Why not join a choir? Join a local choir. Sometimes all we want to do is to sing and to meet people. Being in a choir is a wonderful way to meet new people and experience a real community spirit. Having conducted the Chippenham Rag and Bone Community Choir, we have had some amazing people join and come along to sing with us. It is a great opportunity and you can give as much or as little as you like. Type in local choirs into a search on Google.Which local choir could you join? What sort of music would you like to sing? Recording a demo is easy. Even on your phone. Record a simple 3 track demo to get gigs. Already got an act? Record 3 rough songs and put them on sound cloud and or a CD and take it around to pubs that have music. The mistake that many musicians make is to get far too precious about demos. Most venue owners just want to know what sort of style you play and to see what you look like. When I used to play in a blues band, just going into a pub with a cassette tape of our rehearsal was enough to get lots of gigs. Chatting to people when you give the tape over is more important than anything.What songs would you put on your demo? How simple is it to record those songs? Sharing your gift. Before Christmas, the Chippenham Community Choir sang at an old people’s home just across the road from where we rehearse. The performance was somewhat impromptu but we were able to sing all of our material and people also had a wonderful opportunity to join in with us on the carols. The feeling of being able to give something back is tremendous. The audience were also so very accommodating which was lovely and reassuring for all of us singers. 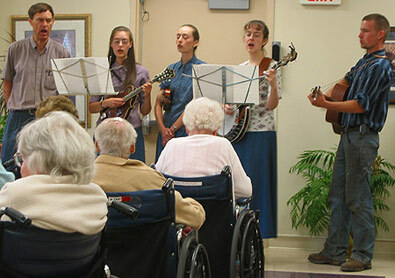 Most old people’s homes are very welcoming for musicians and music with which the residents can join in is always a winner. It certainly set me up for Christmas.Which places could you contact? This entry was posted in Uncategorized and tagged choirs, community, demo, joining a choir, Music for all, old people, recording a demo, singing. Bookmark the permalink.